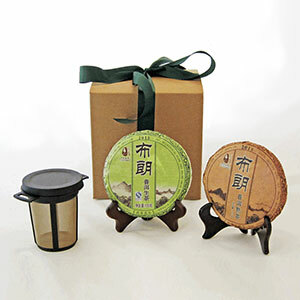 This gift pack consists of a Bulang raw mini tea cake, a Bulang ripe mini tea cake and a Finum permanent tea infusion basket. If you never tried or only had limited exposure to Pu-erh tea, this gift pack provides you with the opportunity to explore the different flavor profiles of a raw and a ripe Pu-erh. You can brew the tea in any size mug you have at home (or at the office) using the space-efficient, dishwasher-safe and very functional tea infusion basket. The basket comes with a lid which turns into a drip-off tray when the basket is removed from the mug and placed on the tray. Many of my friends and book club members have enjoyed Lisa See's book. It's been fun to share this tea with them. Since the book talks so much about tea cakes, it also helps to have real tea cakes to show. I love the tea strainer and have used an identical one for years. Now my husband has his own. The tea pick that is included is just one more aspect of this wonderful experience. I was intrigued with pu'er tea after reading Lisa See's book and this was the perfect introduction. I liked that the gift pack included the very practical infuser and a special pick to break away tea from the cake. The only issue I have is that there is no identification on the cakes as to which is the raw and which is the ripe tea. I sent an email to ask, but did not get a response. Our responseDear Marilyn, thank you for your nice review. I am so sorry for not responding to your question. I must have missed your email somehow. My apology. The cake in the green wrapper is raw and the cake in the brown wrapper is the ripe. Your point is well-taken. I will for sure to label the cakes from now on. Thank you. A perfect gift for a tea lover. I am glad it came with an infuser (good for a pot or a cup) I enjoy the taste of the black tea. I haven't tried the green yet. Seeing tea in a cake is unusual for me and I like the unusual. Tea pick was a cute addition. I am a coffee drinker trying to make the change to tea. This is a lovely way to make the shift.